Every now and then we look for ways to have shiny long hair. After all, hair is something that can give your face a requisite makeover. According to science, hair grows between 0.3 to 0.5 mm per day, 1 to 1.5 cm a month and 12 to 15 cm a year. Hair also takes credit for being the second fastest growing tissue in the body. But still, we all face one problem or another regarding our hair. 1. Make friends with scissors. When you are dying to grow your hair out, getting scissors anywhere near your hair is like a nightmare. However, the reality is just the opposite of what you’re thinking. It’s advised to get a trim for your hair on a regular basis, and more often if you’re trying to grow it out. Trimming your hair not only gets rid of your broken, split ends, but also helps maintain the health of your hair. No split ends mean the damage won’t travel up to the roots, and you can flaunt the healthier, fuller version of your hair. And don’t forget, it’s much easier to style trimmed hair. 2. Never ditch your conditioner. First, there’s a myth about the duration of keeping the conditioner on your hair and we have to tell you this just isn’t true. Against popular belief, the conditioner has instant beneficial effects on your hair. Other than that, it also saves us from towel damage which is the damage caused by wrapping our wet hair in a towel. Don’t think conditioner is only for few particular hair types. It is a must to maintain the good health of all hair types. So apply conditioner after every wash and let your hair down! 3. Get help from some magic ingredients. Applying a few ingredients directly on the hair and scalp have also been suggested. For instance, onion and garlic juice, gooseberries, shikakai, apple cider vinegar, and coconut milk give nourishment to hair and improve hair growth. They not only help with growth, but also help with the overall health of your scalp and hair. If you thought beer was only supposed to be chilled and consumed, try boiling it. After boiling it, add your regular shampoo to it, and wash your hair with it. You will realize how advantageous beer is either way. You can easily wash your hair this way twice or three times a week. Beer shampoo not only helps remove all kinds of impurities from hair, but also acts as an excellent conditioner. A hair mask or oiling of the hair should be religiously followed on a weekly basis. This is important if you want to boost hair growth. This also helps the hair retain essential fats, which keeps it healthier. A tip for oiling your hair is applying oil to damp hair. This will help you shampoo off the oil completely and easily. Getting spa treatments is one way to do this, but you can do it at home too by making hair packs that can work wonders for your tresses. Ingredients like honey, lemon, avocado, olive oil, and, onion juice are some of the ingredients that can be used for making a hair mask. 5. Swap your cotton pillowcase for a silk one. This is an easy change that you can make to help hair growth. Instead of the cotton ones, switch to silk or satin pillowcases that have been noted to boost hair growth. The reason behind this is that the softness of the silk and satin fabric, as opposed to cotton, is better for your hair. The silk or satin don’t cause friction, which makes your hair less tangled. And this way, your hair breakage is also minimal. It doesn’t matter how soft your towel is, it will always contribute to damaging your delicate damp hair. Women often wrap their hair after washing, which is certainly not advised as it can cause damage to hair strands while they get tangled in the woven fibers of the towel. If your mission to increase the length of your hair is genuine, try and stay away from heating tools for hair, like hair dryers, straighteners and curlers. Any kind of heat causes damage to your hair. You may use a hair dryer after your hair is at least 60% dry naturally. You should also use hair protection spray before using a hair dryer. 7. Let your hair breathe. Our busy schedules, and time spent outdoors force us to use several things on our hair. This makes our hair tired and much more prone to damage. First, if your mission is to have long hair, don’t tie it back too tight. This unnecessary pulling can cause splits and breakage. Hair also tends to catch microbial infections which can lead to poor hair growth. So it’s important to get antimicrobial treatments from time to time to let the hair grow without any hinderance. Another important thing to keep in mind is covering your hair when going out. The heat of the sun can cause bad damage to your hair just like it can to your skin. So wear a hat or apply hair sunscreen. It has been noted by scientists that eating certain food can boost hair growth. In particular, food ingredients rich in biotin or Vitamin H, which act as a fuel for body, are advised. They tend to help with the metabolism of fats, carbohydrates, and amino acids and they help elevate the protein level in the body. This, in turn, helps the hair to a great extent as hair is made up of protein. Foods rich in biotin are milk, cheese, eggs, all kinds of nuts, pork, cooked liver, sardines, salmon, cauliflower, and avocado. 9. Don’t be too eager to wash it. It’s not good to wash your hair too often even if you hear that you shouldn’t let your hair be dirty. It’s right that clean hair grows faster, but at the same time, washing it regularly will do no good. Washing it daily can make it dry and help it lose its natural essential oils. It’s also advised to massage your hair gently and easily while washing and comb your hair afterward. 10. Combine onion juice and coconut oil. 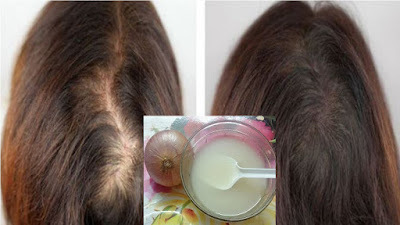 The advantages of onion juice for hair regrowth are well-known. Onion juice has been proven to be effective in the treatment for alopecia areata. Onions regulate the hair growth cycle and give direct nourishment to the hair follicle. When onion juice is mixed with coconut oil the benefits get doubled. Coconut oil helps to retain the natural oils of the hair strand, thus preventing dryness. Coconut oil is also a rich source of vitamin E and lauric acid. If you can’t find coconut oil, you can also use almond or mustard oil. Hair cannot grow overnight. But the stress about it will have a negative effect for sure. On average, a hair strand grows a quarter of an inch to half an inch per month. Even if you perform all the above things, it can grow up to 1 inch at the max. So, it’s important that you have patience, keep following the hair growth plan, and don’t stop doing treatments in between. After all, you have dreamt of having long silky tresses which may take time. Healthy, long, and shining hair are everybody’s dream and a difficult task at the same time. We hope we have given you solutions for some of your difficulties. Please share more of the tips you use to make your strands lovely.